Athletes who push their bodies beyond their physical limits are at particular risk for developing the condition. The dangers of too-intense exercise are in the spotlight after several college athletes in Texas have reportedly become sick with rhabdomyolysis, a syndrome characterized by damaged muscle that actually starts to dissolve. A dozen members of the University of Houston women’s soccer team developed the potentially life-threatening condition after a recent workout, Click2Houston.com reported. The station noted that after some of the women ended up in the hospital, a strength and conditioning coach was no longer working with the team. In a statement to TODAY, the University of Houston said it “takes very seriously the wellbeing of all of our students and fully investigates any issues that arise related to the health or safety of members of our campus community.” The school added it could not comment on any specific matters involving the health of individuals or personnel actions due to federal privacy laws. Rhabdomyolysis, also known as rhabdo, is rare, with about 26,000 cases reported each year in the U.S., according to the American Academy of Family Physicians. It happens when damaged muscle starts to break down, releasing muscle fiber contents into the blood, which can cause kidney damage. About 15 percent of patients suffer from kidney failure. Athletes who “push their bodies beyond their physical limits” are at particular at risk for developing the condition, wrote Dr. John Graves, an associate professor of nephrology and hypertension at the Mayo Clinic in Rochester, Minnesota. Brogan investigated the case of a woman who developed exertional rhabdomyolysis after a spin class. The woman’s urine had turned dark and the muscles in her thighs had become swollen and extremely painful. Besides overexertion, other possible causes of rhabdomyolysis include crush injuries, certain medicines, drug use, severe dehydration and seizures. Symptoms of severe exertional rhabdomyolysis can begin in the first few hours after the “triggering exercise bout” and peak over the next two days, according to the National Collegiate Athletic Association Sports Medicine Handbook. It’s vital all coaches recognize the signs early, it notes. “Group workouts in general can be risky if they drive all athletes at the same pace and intensity. Sometimes the athlete who tries the hardest to meet the demands of his/her coach suffers the worst ER [exertional rhabdomyolysis],” the handbook warns. Doctors obviously don’t want people to stop exercising, but they caution against pushing yourself to extremes. Be aware of the symptoms and seek medical help if you experience signs of rhabdomyolysis. 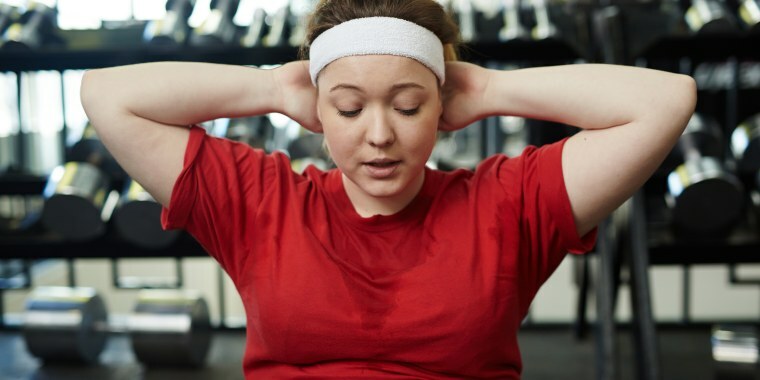 “Essentially, the way that people seem to get exercise-related rhabdomyolysis tends to be when they're doing first-time activities, especially high-intensity activities, like spinning or multi-modality exercises like CrossFit,” Dr. Todd S. Cutler, a hospitalist at New York-Presbyterian/Weill Cornell Medical Center, told NBC News.